On August 1, in the midst of a confrontation between the Lof Cushamen Mapuche community in Patagonia and the Argentine Gendarmerie (border patrol), Santiago Maldonado went missing. Multiple witnesses saw Maldonado being detained by the Gendarmerie and put into a van. Yet, there is no official record of his detainment, and nothing has been seen or heard of him since. 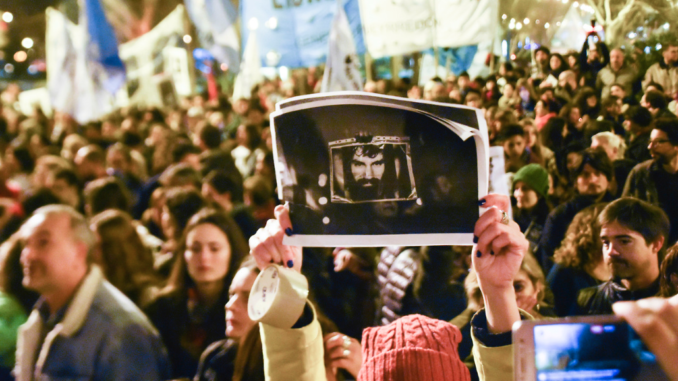 This case recalls the tens of thousands of forced disappearances that occurred under Argentina’s military dictatorship between 1976–1983, but now under a democratically elected government. In this interview, Diego Sztulwark discusses the national and international context of Maldonado’s disappearance and its broader political implications. On the one hand, this is but the latest case of increasing repression as the right consolidates power after a decade of “progressive governments,” not only in Argentina, but across South America. As part of this consolidation, the right seeks to discipline the disobedient elements of society that rebelled against neoliberal policies during Argentina’s 2001 crisis. However, Sztulwark also situates it in a longer historical narrative: going back to the initial European colonization and the ongoing struggles of the Mapuche for their ancestral lands. This struggle continues to be of the utmost importance today as the Macri government strengthens the neo-extractivist policies begun under the Kirchner government. 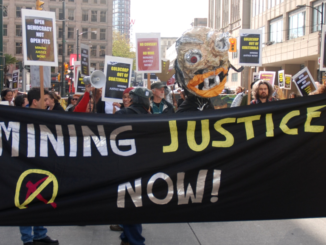 Thus, beyond responding to the specificities of the situation in Argentina, Sztulwark’s analysis highlights the fundamental relationship between neo-extractivist capitalism and violence, and provides crucial steps in an investigation of the concrete technologies of power deployed by the state and capital across multiple scales and multiple spaces. Amador Fernández-Savater: Who is Santiago Maldonado? What was the context of his disappearance? What do we know about what happened? Diego Sztulwark: Well over a month ago – on August 1st – in the midst of the National Gendarmerie’s repression of a Mapuche community in the Argentinean Patagonia, Santiago Maldonado, a young man from Buenos Aires who tended to earn a living as an artisan, disappeared. The last that is known of Maldonado, as witnessed by various community members, was that he was captured by the Gendarmerie. 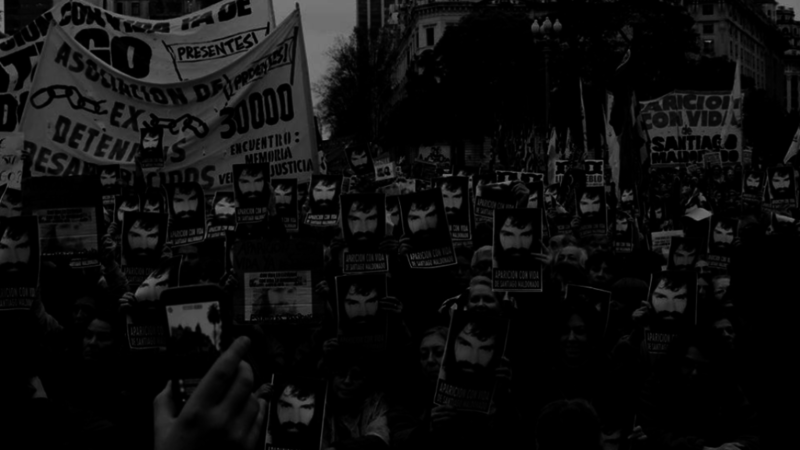 D: Despite an extraordinary social mobilization asking “where is Santiago Maldonado?,” the government has done everything possible to confuse people and to prevent things from being clarified. The prosecutor described the case as a “forced disappearance.” The reaction from the Executive Power and an impressive majority of the press was disconcerting. Instead of investigating the Gendarmerie and the political powers, they acted as if Maldonado had gotten lost. They looked for him in distant provinces and even in Chile. Later they asserted that he had been murdered by a Mapuche! They have dedicated themselves to lying, to spreading false information. Now they are trying to blame a couple of gendarmes to avoid their own organic responsibility in the incident. The state’s response brings back memories of the dictatorship’s propaganda: “The disappeared are in Spain.” This reaction from the government and the mass media confirms the “forced” nature of the disappearance: not only is it a state body (the Gendarmerie) that acts in the disappearance, but also the state itself goes on to prevent it from being investigated. A: Describe the conflict between the state and the Mapuche people. What is its history? D: The conflict between the state’s security forces and the Mapuche people is centered around the Mapuche’s fight for their ancestral lands in the southern part of the country, which are currently occupied by large corporations like Benetton (cattle ranching, wool production, monoculture forestry) or the Roca, Bemberg, and Lewis groups, among others. In any case, this appropriation of land involves legal irregularities and conflicts with displaced populations. This reaction from the government and the mass media confirms the “forced” nature of the disappearance: not only is it a state body (the Gendarmerie) that acts in the disappearance, but also the state itself goes on to prevent it from being investigated. Macri’s government has accepted the diagnosis of the United States Southern Command1?that includes the Mapuche struggle in the list of new threats to state security. That is, it the government starts from the idea that struggles for land and the Mapuche communities are structurally criminalizable. It is important to understand that, on the ground, the repression was commanded by Pablo Nocetti, the Ministry of Security’s chief of staff, a lawyer for military leaders from the last dictatorship, and an apologist for state terrorism. This fact makes it impossible to blame the Gendarmerie autonomously, without implicating the political power that gives the orders and directs the procedure on the scene. On the other hand, there were already serious precedents. During the month of January, we learned about a case of brutal repression by the Gendarmerie against a Mapuche community in struggle. As in the current case, in that instance of repression, the Gendarmerie acted well beyond any judicial order, yet with clear political support. 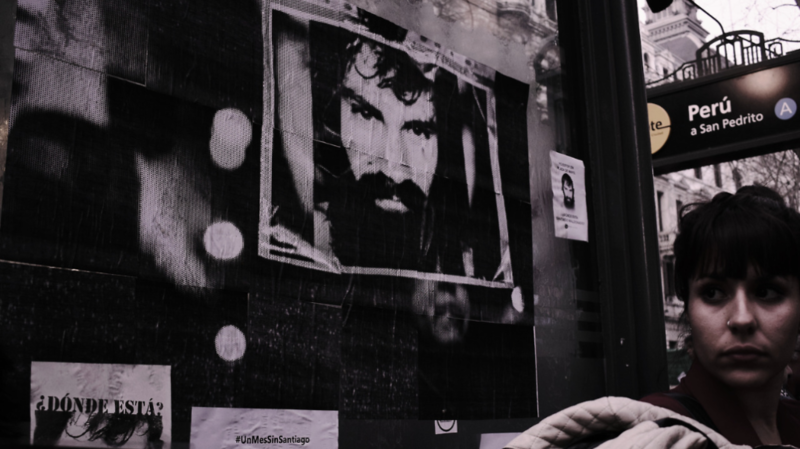 A: What is the social and political context of Santiago Maldonado’s disappearance? How is this disappearance linked to the current moment of Macri’s government, two years after he reached power? D: To connect the forced disappearance of Maldonado to the contemporary context, we must pay attention to the communication strategy used by Macri’s government starting in March of this year. I am referring to the repression against teachers who tried to mount a tent in the Congressional Plaza as part of their struggle over wages and in defense of public education, against women mobilized by the Ni Una Menos movement against femicides, against the Pepsico workers in their struggle against layoffs, and against piquetero groups demanding the declaration of a social and food emergency. In all of the cases – there are more – official violence acts in an “expressive” manner, as the anthropologist Rita Segato would say: rather than achieving precise objectives, state violence communicates an aesthetic of cruelty (the destruction of empathy and sensitivity) to society. In this way, it seeks to complete the task of socially remodeling the country that emerged from the 2001 crisis.2 The application of this repressive violence forms part of the production of a certain “normality” – that is, a cynical sincerity of hierarchies and inequalities – and the creation of codes so that each individual can voluntarily access the dynamics of social integration, outside of which all existence is perceived as a pathologized or criminal threat. In short, it is violence exercised in the name of peace that tends to construct any anomaly under the horizon of terrorism. The motto seems to be “friendliness” for those who live within the norm, and repressive action for those who dare to not fit into the order. It is necessary to clarify that this “norm” is the most banal thing in the world: the company form as a mode of cooperating in the creation of wealth; the police form to provide security; continuous stress around the crisis to build permanent consensus on the country’s governance. The disappearance of Maldonado brings together and allows us to understand how all the ingredients of this regime of the establishment of order function: police power; the racist and stereotyped treatment of all those who do not fit in; the priority of land ownership as a commodity in service to the business form; stress taken to the extreme in the media and social networks. Photograph by Cecí García, Viewpoint Magazine. D: Absolutely. What has been taking place in the Province of Jujuy is very serious. It is a province dominated by the sugar company Ledesma, which controls the entire political system in the province. Along with Macri’s arrival to the presidency, at the end of 2015, the fearsome Gerardo Morales became governor in Jujuy (from the radical party, he participates in the Cambiemos alliance and reached the government through an alliance with the Frente Renovador under the leadership of Sergio Massa from Buenos Aires). 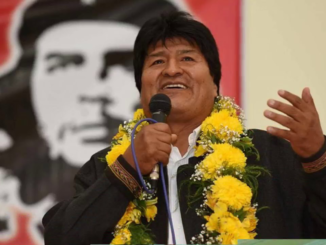 Morales illegally jailed Milagro Sala, the leader of the เล่นคาสิโนออนไลน์ให้ได้เงินTúpac Amaru?Neighborhood Organization, and dismantled the cooperatives and the plans for neighborhoods with affordable housing. It is a scandalous situation. To the point that if today Milagro Sala is under house arrest, instead of in jail, it is only because the struggle for her freedom pressured international human rights organizations, such as the Inter-American Commission for Human Rights, to intervene. From the government’s point of view, it is about disabling a “parallel state” and demonstrating that no poor Indian woman is going to challenge the power of ingenuity and the parties that sustain it (radicalism and Peronism). Horacio Verbitsky, a journalist (the lead columnist of Página/12) and president of the Center for Legal and Social Studies (CELS), has carried out a full and real time investigation of the irregular detention of Milagro Sala. A: At a time when, at an international level, the powerful and electorally victorious right is protectionist, pro-sovereignty, anti-globalizing (Trump, Brexit), Macri is surprising. What type of government is it? How has it acted once in power? D: The objective of the first two years of the Cambiemos alliance’s government was to discipline society and take the country off the “populist” path (as they characterize the so called “progressive” governments in the region), increasing the concentration of income – with the consequent increase in inequality –, transferring power to the state’s repressive agencies – which led to an increase in repressive violence –, questioning the narration of recent history based on the contributions of human rights organizations – which empowered the racist, classist, and patriarchal mechanisms already present in society – and returning to the model of foreign debt – renewing the mechanisms of financial valorization, speculation, and capital flight. A: Does Macrismo represent a radical shift in respect to Kirchnerism? What are the continuities and discontinuities? D: As I said previously, the Macrista program seeks to reform the society that emerged from the 2001 crisis and, if it is applying these reforms gradually, it is only because at the moment it does not have the political strength to advance with greater force. At the same time, Macrismo is a correct interpretation of the conditions in which Argentina is inserted into the world market – as a food and energy producer – and of the drive for consumption that, far from strengthening popular democratic organization (the program of popular participation in the enjoyment of wealth), rather subjectivated a large part of the population in neoliberal terms: modes of life dominated by stability via consumption, the consumption of modes of life. From this point of view, it is not possible to make a profound critique of Macrismo, without also critiquing Kirchnerism, or rather, critiquing the creation of an unconscious of order and stabilization that created the conditions for the emergence of a right-wing that today seeks to replace Peronism as the fundamental mediator. Along with broadening rights, Kirchnerism strengthened policies of neo-extractivism and monoculture as important economic pillars, policies that Macrismo fully appropriated. Having said that, it must also be clearly stated that Macrismo is a completely reactionary phenomenon and that, as much as it endorses new democratic elements, it brings together in one block the country’s conservative reaction to the plebeian elements that emerged with the 2001 crisis and was constantly engaged in negotiation with Kirchnerism. Lastly, although it’s not the moment to get too deep into this, it is not possible to think about the current moment of the Macri government in Argentina without putting it into a regional perspective, particularly in relation to the institutional coup against the PT government in Brazil. A: In order to understand the specificity of Macri’s government, you have spent time analyzing the figure and the thought of the philosopher Alejandro Rozitchner. Why? How does this character and his thought work for you as an “analyzer”? D: What is noteworthy about this philosopher, who started advising president Macri and his governing team on communication issues, is his commitment to offering them content created by the countercultures of the 1960s, ’70s, and ’80s. Among these themes – from marijuana to the entire culture of rock, from non-religious spirituality to quotes from Nietzsche –, are elements from the work of his father, León, a notable leftist Argentinean philosopher, who was committed to the continental projection of the Cuban revolution. In the 1970s, shortly after the publication of Che Guevara’s key writings about the role of subjectivity in revolution – Socialism and Man in Cuba3 – León Rozitchner writes a brief article entitled “The Left without a Subject.” In this already celebrated text, the philosopher warned of the necessity of including the subjective – affective, psychological – transformation as part of the objective transformation propelled by leftist politics. The material aspect of the revolution must include the sensual dimension of existence denigrated by Christian capitalism. Decades later, his son writes a reactionary appropriation of those unresolved tasks, an irreverent vanguardism in the service of capital. It could be said that the son alters the title of his father’s book and writes “The right without a subject”: he teaches the new agents of the development of the productive forces to include an ethics of enjoyment, of the sensual, and of enthusiasm. This attempt has a certain value in renewing the face a right-wing that does not want to look into the mirror and see itself reflecting the last military dictatorship. Alejandro Rozitchner is the communicator of a discourse that teaches how to love the chains of neoliberalism. A: You say that there is a “climate shift” in Argentina. Is the Macri government’s “hard mode” (violence, lies, disappearance) replacing the “soft mode” that could be symbolized by Alejandro Rozitchner? Now, during a long first year of the presidency, the national government took pains to show a “friendly” and “neighborly” face. This ended at some point this year. It is possible to date this change to the already mentioned repression against teachers in March. From this televised repression against teachers wearing their white uniforms, on a rainy Sunday, others would follow: hunting down women who had participated in one of the multitudinous marches convened under the names “Not One (Woman) Less” and the “International Women’s Strike”; the savage eviction of a protest of organizations of the unemployed while they were engaged in negotiations with the government; or the recent repression of the workers in a Pepsico factory who were resisting a large batch of layoffs. To finish composing the picture of this situation, it is important to remember that in May 2017 the Supreme Court ruled in favor of applying a rule that would have reduced the sentences for torturers who were active during the last dictatorship. The rule that was invoked – the so called “two for one,” which would reduce sentences for ordinary prisoners if they had been detained for years prior to sentencing – would have allowed hundreds of agents of state terrorism to avoid fulfilling their sentences. Fortunately, a huge march of 500,000 people in the Plaza de Mayo and across the country put an end to that possibility within a week (the three branches of government ended up going back on their words). However, it is worth reflecting on two events that form part of this series: the day before the protest, the Argentine bishops announced a process of national “reconciliation” bringing together family members of victims and repressors to “get to know” their testimonies; and, on the other hand, the composition of the Supreme Court had just been changed and among the new members was a judge, Carlos Rosenkrantz – his was the decisive vote in the ruling – who had been proposing a doctrine of impunity for the military. It was for this reason that he was challenged by human rights organizations, when he was approved in the Senate, a chamber largely controlled by Peronism at that moment. If we look at the chain of repressive episodes simultaneously, together with the attempt to establish impunity for the cadres of the dictatorship, we can see more clearly why the case of Santiago Maldonado is a turning point that stresses all of the country’s democratic energies. A: A persistent thesis in your writings is that there is a strong link between contemporary forms of violence and the dictatorship. You speak of “state terrorism” as something that is very present: a sort of latent backdrop, always able to be activated. It can sound like an exaggeration, a provocation. How do you justify this historicity? There is a history that must be kept in mind because its basic lines continue to act in the present. The bombardment of the Plaza de Mayo, and the overthrow of Perón’s government, supported by a significant popular mobilization, led to decades of violence. During the last military dictatorship, from 1976-1983, a “terrorist state” was created (this early characterization made by Eduardo Luis Duhalde in a book5 that carries that same title is important). State terrorism applied violence not only to dismantle armed revolutionary groups (something that it managed to do by around the year 1977), but also to surgically remodel the country’s social structure. To put it shortly: it drove a model of accumulation based on financial valorization (an issue that the economist Eduardo Basualdo and his team explain very well), the diffusion of terror as the threat of annihilation within the social body (here again the reference to the work of León Rozitchner is essential) and safeguarded the relationship between the concentration of wealth and the armed defense of private property, something that none of the later democratic governments ever questioned. The democracy after 1983 was founded on the basis of a complete lack of will to question the principal lines of continuity with this violence on which the concentration of private property is based. If we look at it closely, that relation between economy and terror continues to be the principal problem of Argentine democracy: the inability to question the concentration of land ownership, the control of food, the means of communication, or finance. A: It is not simply a theoretical analysis, but also a condemnation being made by Argentine social movements, is it not? D: More than a rhetoric of denunciation, this description of events constitutes a knowledge belonging to the main popular struggles that, over the years, have been placing limits on and attempting to question this state of things: the appearance of the Mothers of Plaza de Mayo and the human rights movement that even today are the principal constraint on Macri’s government; the constitution of the piquetero movement around 2001 – and, along with it, a plurality of subjectivities of the crisis, from recuperated factories to the escraches of HIJOS – that activated a communitarian force and an insurrectional nature to destitute the neoliberal dynamic that was hegemonic at that moment; and the current women’s movement, which has been capable of demonstrating the patriarchal content of state, economic, and domestic violence, and of reconstructing the relationship between state terrorism and femicide. The problem of violence has never stopped being an absolutely central question in the country’s history. These three movements have, in my judgment, something in common: they constitute an offensive on the field of sensibility – that is something that Rita Segato, as well as others, insist on – as the field in which the already mentioned aesthetic of cruelty operates. The great legacy of the human rights movement is a lucid compression of the desensitizing nature of the violence that creates terror. Therefore it is necessary to create spaces of sensibilization where it would be possible to elaborate that violence, to give rise to a counter-aggression of another nature, and to translate – in that medium of the sensual – struggles that lack an a priori common language. A: In various texts, you argue that neoliberalism is not only imposed from above, but rather it is a more complex dynamic. And violence? D: Repressive violence was not invented by Macri, but is an intensification of a constant variable that had not disappeared during the previous government. The “economic growth” of the years before the crisis was translated into the everyday in terms of the consolidation of precarity – precarity of existence, of labor, and of affect – and a growing demand for “security” that permeated all levels of society. To understand this, it is necessary to return to the hypotheses of Rita Segato, for whom the establishment of a rentier economy that extracts value outside of any regulation of public powers tends to construct clandestine modes of regulation that segregate informal violence, which can create a dark sovereignty in the territories.6 Episodes of lynchings, police shootings, justice “by one’s own hands” or cruel messages on social media already warned of the diffusion of a violent hatred toward anything that obstructs a certain ideal of order and normality, in which precarity is sometimes a mobilizing utopia. Macri’s government retakes this dark passion that had been uninhibited and gives it a symbolic and institutional channel. He engages in politics with it. He connects it to a promise of order based on the multiplication of security forces in the territories and in the promotion of a code of identification with which everyone can feel an integral part of this new order. A: What forms of resistance are appearing and seem to be the most promising challenges to this order? Do they involve mobilizations, electoral channels, a combination of both? D: The government tries to spread the idea that today there is no legitimate opposition to its project, which is offered as a way of purging society after the violence of the crisis and the festival of populism. Nothing would be more catastrophic than to believe it (something that could happen if in October the midterm elections discourage the expectations that one might have with Kirchnerism or the leftist options). 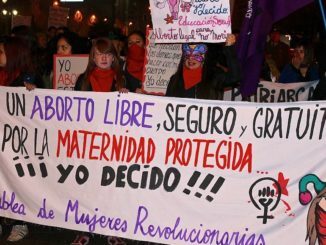 On the contrary, the massive protests against the two for one, or for Santiago Maldonado’s appearance; those convened by the women’s movement and the workers’ mobilizations – of which there is no shortage and that have renewed interest in combining, like never before, the demands of formal workers with those of workers from the informal popular economy – speak to us of a society that has not been defeated and that is capable of organization. The interest of this social activism is redoubled when we perceive it on a micro level, in educational experiences, in those of health workers, in networks of social workers or artists. A new example of this is the massive opposition of high school students against the process of reform being carried out by the government of the city of Buenos Aires in favor of imposing the model of the business world onto education. There are forces processing the new scenario, attempting to breakdown the perplexity, and a recreation of affects and ideas is – very likely – underway, as is, I hope, a new intellectual aggressiveness. –Translated by Liz Mason-Deese, who?teaches Geography at the University of George Mason and is a member of the editorial collective of Viewpoint Magazine. Originally published in El Diario. USSOUTHCOM, located near Miami, FL, is one of nine Unified Combatant Commands in the U.S. Department of Defense and is responsible for coordinating operations and security cooperation in Central and South America and the Caribbean. It has been accused of and investigated for multiple human rights violations, including supporting state terrorism in multiple Latin American countries and participating in the 2009 military coup in Honduras.?? Colectivo Situaciones, 19 & 20: Notes for a New Social Protagonism, trans. Nate Holdren and Sebastián Touza (New York: Minor Compositions, 2012) ?? Ernesto Che Guevara, and Fidel Castro, Socialism and Man in Cuba, 3d ed.? (New York: Pathfinder, 2015) ?? David Vi?as, Indios, ejército y frontera (Buenos Aires: Siglo veintiuno editores, 1983) ?? Eduardo Luis Duhalde, El Estado terrorista argentino (Barcelona: Ed. Argos Vergara, 1983) ?? Rita Laura Segato, La escritura en el cuerpo de las mujeres asesinadas en Ciudad Juárez: territorio, soberanía y crímenes de segundo estado (Buenos Aires: Tinta Limón, 2013).?? Diego Sztulwark is a member of Colectivo Situaciones, a militant research collective based in Buenos Aires, Argentina. In addition, he is involved with the publisher Tinta Limón, regularly blogs for Lobo Suelto, and participates in the Instituto de Investigación y Experimentación Política (IIEP). Two recent Colectivo Situaciones books have been published in English: 19 & 20: Notes for a New Social Protagonism and Genocide in the Neighborhood. Amador Fernández-Savater is an independent investigator, editor of Acuarela Libros and the Revista Alexia. Amador has participated in various social movements (student, anti-globalization, copyleft, anti-war, V de Vivienda, 15-M). He is the author of Filosofía y acción (Editorial Límite, 1999), co-author of Red Ciudadana tras el 11-M; cuando el sufrimiento no impide pensar ni actuar(Acuarela Libros, 2008), Con y contra el cine; en torno a Mayo del 68 (UNIA, 2008) and Fuera de lugar. Conversaciones entre crisis y transformación (Acuarela Libros, 2013). He also runs the blog “Interferencias” on eldiario.es.